Colorado places a very high emphasis on education. Metro Denver boasts one of the most highly educated populations in the United States. The high school graduate rate over 75% is well above the national average. According to the State Social Facts over 36% of Colorado residents have a bachelor’s degree or higher. 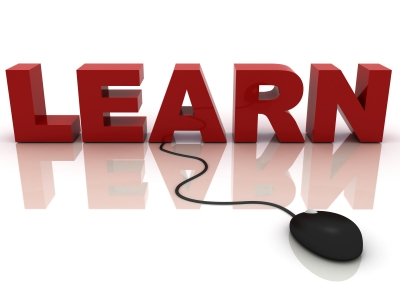 Colorado offers wide variety of education in both public and non-public sector. Our public schools are highly regarded and therefore most children attend public school. The non-public sector offers many choices from prestigious prep schools to private religious schools. The term “non-public school” applies to private, parochial, and independent schools which provide education to children of compulsory school age. Neither the State Board of Education nor any local board of education has jurisdiction over the internal affairs of any non-state independent or parochial school in Colorado. The school boundaries do not follow city or county boundaries, please see Denver Metro School Districts. Below the map is basic information and geographical location of public school districts within the metro area. Adams County Schools – Located in the northern suburbs. Average Senior SAT cumulative was 1019, with 73% of seniors pursuing higher education. District-wide, average dollar spent per pupil is $4,827 and pupil/teacher ratio is 24.2. Dropout rate for grades 7-12 is 2.1%. Sixty-one percent of teachers have a master’s degree or higher. Aurora Public Schools – Located in the eastern suburbs. Average Senior SAT cumulative is 1015, with 55% of seniors pursuing higher education. District-wide, average dollar spent per pupil is $4,742 and pupil/teacher ratio is 26.1. Dropout rate for grades 10-12 is 3.6%. Fifty-two percent of teachers have a master’s degree or higher. Boulder County Schools – Located north of Denver in Boulder County. Average Senior SAT cumulative is 1122, with 73% of seniors pursuing higher education. District-wide, average dollar spent per pupil is $5,721 and pupil/teacher ratio is 18.3. Dropout rate for grades 10-12 is 2.3%. Seventy-five percent of teachers have a master’s degree or higher. Cherry Creek Schools – Located in the southern suburbs. Average Senior SAT cumulative is 1111, with 80% of seniors pursuing higher education. District-wide, average dollar spent per pupil is $4,855 and pupil/teacher ratio is 17.7. Dropout rate for grades 10-12 is 1%. More than fifty-seven percent of teachers have a master’s degree or higher. 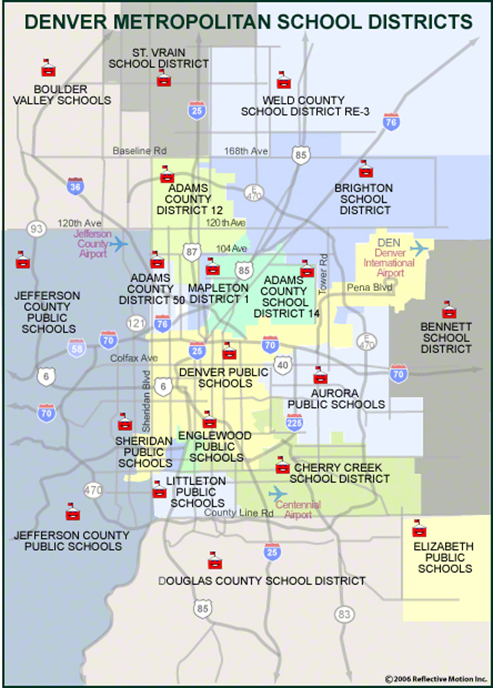 Denver Public Schools – Located in city and county of Denver. Average Senior SAT cumulative is 1045, with 73% of seniors pursuing higher education. District-wide, average dollar spent per pupil is $7,200 and pupil/teacher ratio is 19.3. Dropout rate for grades 10-12 is 7.4%. Forty-three percent of teachers have a master’s degree or higher. Douglas County Schools – Located in extreme southern suburbs. Average Senior SAT cumulative is 1067, with 80% of seniors pursuing higher education. District-wide, average dollar spent per pupil is $4,861 and pupil/teacher ratio is 22.1. Dropout rate for grades 10-12 is .7%. Fifty-five percent of teachers have a master’s degree or higher. Englewood Schools– Located south of Denver, north of Littleton. Average Senior SAT cumulative is 1098, with 60% of seniors pursuing higher education. District-wide, average dollar spent per pupil is $4,595 and pupil/teacher ratio is 26.1. Dropout rate for grades 10-12 is 4.1%. More than sixty-two percent of teachers have a master’s degree or higher. Jefferson County Schools – Located in western suburbs. Average Senior SAT cumulative is 1065, with 74% of seniors pursuing higher education. District-wide, average dollar spent per pupil is $5,332 and pupil/teacher ratio is 21.1. Dropout rate for grades 10-12 is 4.8%. Sixty-two percent of teachers have a master’s degree or higher. Littleton Public Schools – Located in southern suburbs, west of Cherry Creek Schools. Average Senior SAT cumulative is 1082, with 92% of seniors pursuing higher education. District-wide, average dollar spent per pupil is $4,538 and pupil/teacher ratio is 18.5. Dropout rate for grades 10-12 is .7%. More than fifty-nine percent of teachers have a master’s degree or higher.